Hats off to Animal New York and Josh Simenhoff for flying a pro-marijuana banner over Manhattan. 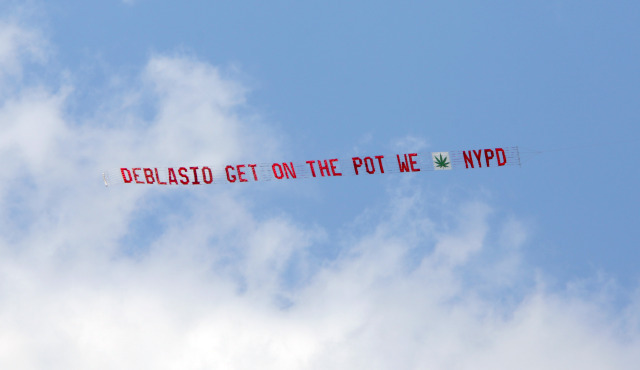 The legend referenced New Mayor Bill de Blasio, whose own history of toking weed never did his career any harm, and a banner ordering the mayor to “get off the pot” and quit. The banner was due to fly earlier but because of bad weather the launch date was put back to 4/20. But that date came and went. So. The banner flew on 4/21. And so on April 21, three months after we intended it to, our tongue-in-cheek, pro-cannabis banner finally hit the Manhattan skyline. After all of the back-and-forth, it was still worth it. “I did this in the pursuit of happiness and I’m proud to be an American,” said Simenhoff. Ditto for us. Also, legalize weed. Because weed never did Blasio ever harm, nor any of his politico pals, like Barack Obama, David Cameron, Bill Clinton (who took weed by osmosis), Michael Bloomberg, Andrew Cuomo and George W. Bush. Unless, of course, it made them nuts..?